How has God worked in your life? How has He shown His great love to you? Take time today to tell the next generation - consider making a "God's Great Deeds Jar". Each day, before you go to bed, write on a piece of paper how God has shown His love to you - big or small ways - in the day you just lived. Put it in the jar. Next year at the start of 2019, take out the slips of paper and enjoy being reminded of how God worked in your life. 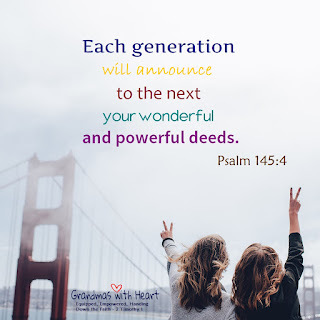 Do this with your grandchildren, so they are able to see how God works in their lives, too! Remember, Tell, Rejoice!